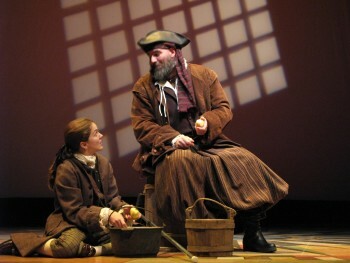 Ken Ludwig's Treasure Island Opens in Washington D.C.
in Round House Theatreâ€™s production of Treasure Island. Playwright Ken Ludwig '72 has a new production, Treasure Island, which opened in Washington D.C. at the Round House Theater December 3. It's the latest stop on a tour that started at the Alley Theater in Houston, Texas last May. Ludwig had a hand in casting and approving every detail of the world premiere in Texas (the set was designed by Eugene Lee, who also did the set design for the Broadway hit, Wicked). However, he says that he had less influence on the production that is now taking place in Washington.“After the world premiere,” he says,“the play goes on its merry way.” Either way, Ludwig says he's just as thrilled to see his play opening in the new location. In fact, the response has been overwhelming. Treasure Island was the biggest hit in the Alley Theater's box-office history, and the Round House has now extended its running dates all the way to December 30, a record-setting advance. In Ludwig's version of Treasure Island, Long John Silver and Jim Hawkins connect through Shakespeare. The Bard, in fact, is a running theme throughout much of Ludwig's writing.“Shakespeare has been such a great part of my existence. I am an aficionado of all things Shakespeare. I studied him at Haverford with Ralph Sargent in the English Department, and went on to study more of him later, and now I lecture on him.” Ludwig finds Shakespeare particularly fascinating because“in none of the other arts is there a single figure that dominates the landscape in the same way that Shakespeare dominates literature, and, particularly, theater.” And Ludwig acknowledges his debt with a small tip of the hat whenever possible. Indeed, Ludwig's prospects as a Bard look good. Treasure Island's tour will make its way across the Atlantic to London's West End, and may even move on from there. Ludwig has also recently finished a musical that is loosely based on the â€˜50s movie An American in Paris which features music by George Gershwin, with whom Ludwig previously“collaborated” for the musical Crazy For You. Finally, Ludwig is working on a movie for Disney, but is not at liberty to speak more on the project.